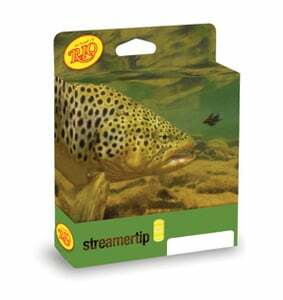 RIO, manufacturer of fly fishing lines, leaders, tippets, and accessories, brings the new StreamerTip® line to market for 2011. RIO recently unveiled its new StreamerTip fly line. As its name implies, this line is ideal for fly anglers who enjoy fishing streamers for a variety of gamefish. The StreamerTip line is based on the RIO’s Outbound short profile, and has a front loaded weight and aggressive front taper to allow for effortless turnover for even the heaviest flies. This makes casting big flies a whole lot easier. The StreamerTip line features a 10-foot clear tip that sinks at a 1.5 to 2-inch per second sink rate, and is ideal for stripping streamers just under the surface. Each line is manufactured with a coldwater coating featuring RIO’s XS Technology for extreme slickness. These lines have a clear tip followed by a yellow body and pale green running line. All lines also feature welded loops on both the front and back ends of the line for streamlined gear changes. RIO’s new StreamerTip Line is available in four sizes, each at a length of 90-feet, (WF5F/I, WF6F/I, WF7F/I and WF8F/I). MSRP is $74.95 at a RIO dealer near you.